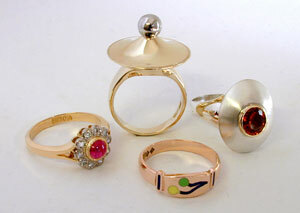 JEWELLERY examples of my work. Welcome to the home page of Peter McBride. 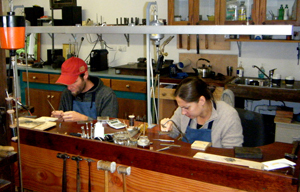 I have been hand making jewellery in Melbourne, Australia for 42 years. 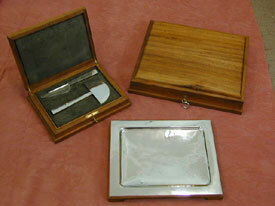 I am also an enthusiastic collector and user of antique and old woodworking tools. My Studio is in Main Ridge, Vic. on the Mornington Peninsula. contact me by phone, text or email to discuss details. 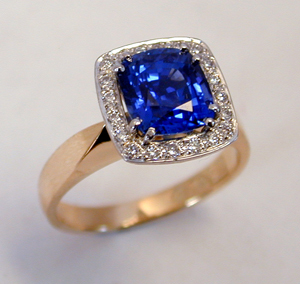 Fine quality diamonds and coloured gemstones such as sapphires, rubies, emeralds and pearls with rich, vibrant colours are used to enhance my designs. This is my maker's mark and it can be found on all items I make. PO Box 135 Red Hill South, Victoria 3937, AUSTRALIA. The image above is my work bench, where I am using one of the traditional goldsmith's tools, a mouth-blown torch, to solder a gold ring. It is an ancient tool, used in nearly the same configuration for thousands of years. Occasionally I will do some silversmithing, making objects for use or decoration in silver with other mediums like Australian timbers. 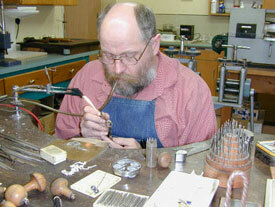 "I enjoy designing individual jewellery with each client. Taking their ideas, contemporary or traditional, and incorporating them into a very personal piece of jewellery"